You can learn a lot about our city by looking at how it was influenced by the bombs which fell on it during the Second World War. The Barbican has to be one of the most obvious examples of this, and it was here that the first bomb was dropped on the City, in Fore Street on the south side on 25th August 1940. Subsequently, almost 30,000 bombs fell on the capital. Many significant areas of London were completely destroyed and even today in many areas of the city economic and social divides are still defined by the ares which were bombed out and the areas which were left standing. Huge divides in the quality of housing are evident when you move a few streets. 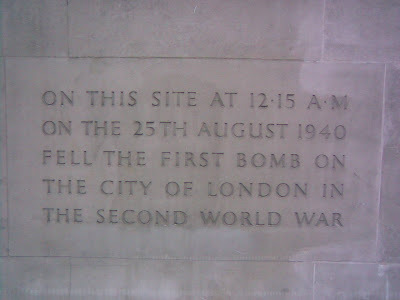 The spot where the the first bomb fell in 1940 is marked by a small plaque, and it wasn't until 1969, 29 years later, that the Barbican Estate was officially opened. Click here for a Channel 4 site with more on the Blitz and here for a short video on later raids.